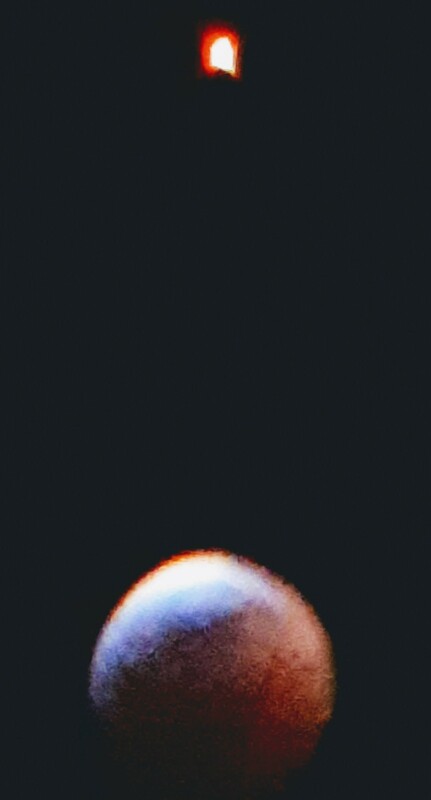 I was taking pictures of the blood moon and this showed up on a picture! Outside in my front of my house at approx 11pm taking pictures of the blood moon. I first saw the object in a picture I took. I thought the object was odd and could not imagine how it got on a picture. I only noticed it in one picture out of the many, many I took, one after the other. No different feelings about it, only that it was unusual, this white disc with an orb around it. End. It's outline looks good... classic flying saucer! This BEAMS edit reveals the true outline of the object - which to our eyes, is very suggestive of a UFO craft! At first glance we thought that this was merely the camera flash reflecting off something, but what? it isn't an internal reflection, because the pictures were not taken through glass, but outside! A camera fault perhaps? Yet we have never seen any digital error quite so dramatic and precise as this before... have you dear reader? No, the more we look at the anomalous image, the more we suspect that our witness might... just might, have actually captured something important, apart from the good old red moon... inadvertently. An outrageous suggestion? not really... bearing in mind that sometimes, on very rare occasions, the camera 'eye' can pick up things undetectable to the human eye; this is a phenomenon that we have come accept through experience in dealing with the UFO subject. We certainly wouldn't discount such a possibility in this case. Seems to us that the sphere surrounding the ‘UFO’ might well be some kind of refracted vaguer image of the Sun – could that be possible? I tried to find that out on the internet, but nothing on it. 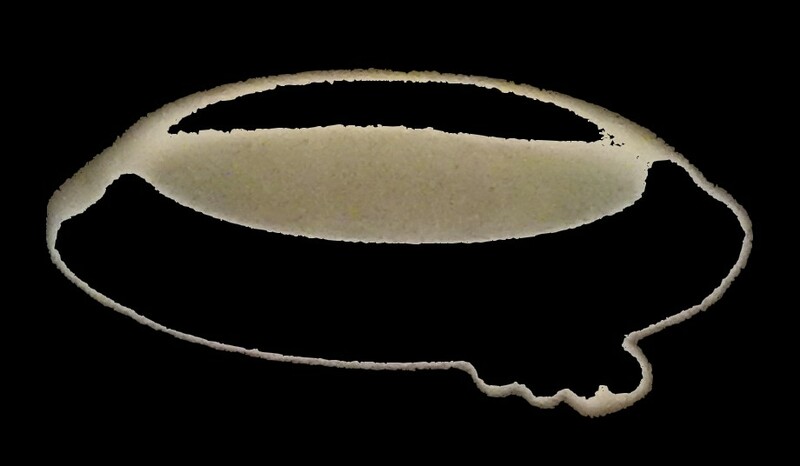 Above, I’ve taken out the image of the UFO to compare: It does seem to have brighter areas at either end. It also seems to have multiple (yellow) flared areas around it’s edges – like the Sun. Major Update 1: Also, just as of things couldn't get any stranger, a suspected meteor hit the Moon during this eclipse causing a flash of light that was visible from Earth, according to astronomers.... must read about it here. Could there be a connection between the craft-like object photographed by our witness and this 'meteor' impact? Could this 'meteor' in fact, have been something else? Major Update 2: UFO Sighting in Victoria, British Columbia, Canada on January 20, 2019: Witness statement: Full moon eclipse January 20, 2019. My partner and I were aware of this event happening, and often try to observe or take photos of the moon or other astrological events with what little technology we have on hand. This particular night we went outside in our area intending to go to a better vantage point, and the eclipse was already almost at its zenith. We had a direct view of the moon from our front yard; a 3/4 story apartment building at the end of the block did not obscure our view of the full moon at all. We could clearly with the naked eye, what was happening. There was absolutely no cloud cover and it was cold enough outside that the windows of the car had frosted a little. We could see many star formations including the big/little dipper, and other planets in alignment, and also some other objects I identified as satellites. My partner had a Samsung camera with a little zoom attachment and was using it to take photos. I had a Canon rebel, but I am a novice and had the protections off as it did not want to take pictures at night. My photos add to the story but are quite shaky and blurry. We captured several photos in sequence. To the naked eye, a square-looking, red object appeared, it looked like a cat with static, but square, and proceeded to circle the moon just below half level of our view of the moons circumference. It came across the moon and it elongated into a rectangle looking object with a spiky red/yellow appearance. As it proceeded on the trajectory it seemed to slow in spots and then move again. I shouted to my partner, "are you seeing this?". "Yes, I do, what is that" was the reply. "Just take the pictures" and we did for a few seconds more until it appeared to pause/jump a bit up and then began to be dissolved or disappear a bit at a time, like going behind a cloud; but there was no cloud cover on that night. Shortly afterwards I saw a plane and could put the size of what we witnessed around 3 times the size of a passenger plane, knowing whatever the object was, was further away and possibly massive. We have some photos that show an object with a white center shaped like a house or box with a triangle on the back. There doesn't appear to be a "tail" like a common meteorite. 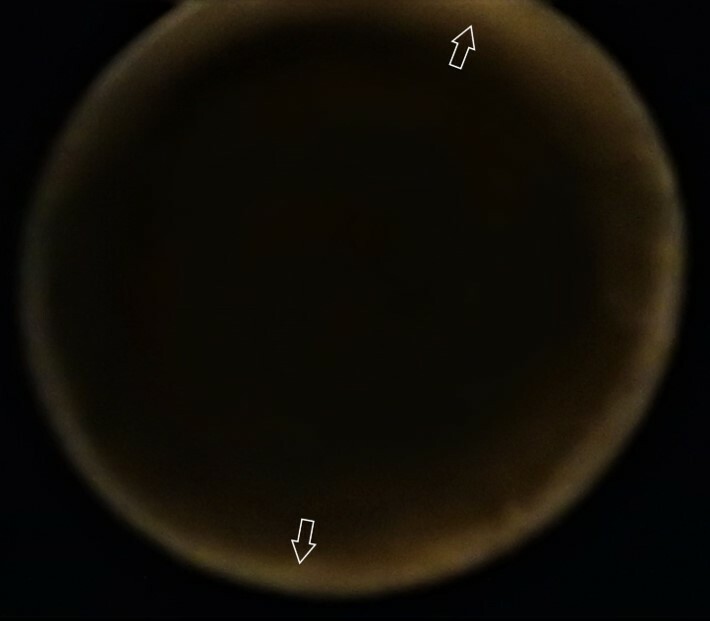 This is in the expanded view from an original photo where the moon in eclipse is clearly seen with the object approaching from the left and another as it leaves on the right. I scoured the internet and news stories, but nothing matches what we saw. End. For reasons of space, here, we have published only the best taken image in this case, as the others contained a good deal of camera shake. Major Update 3: UFO Sighting in Wilmington, Delaware, U.S. on January 21, 2019. See picture below. 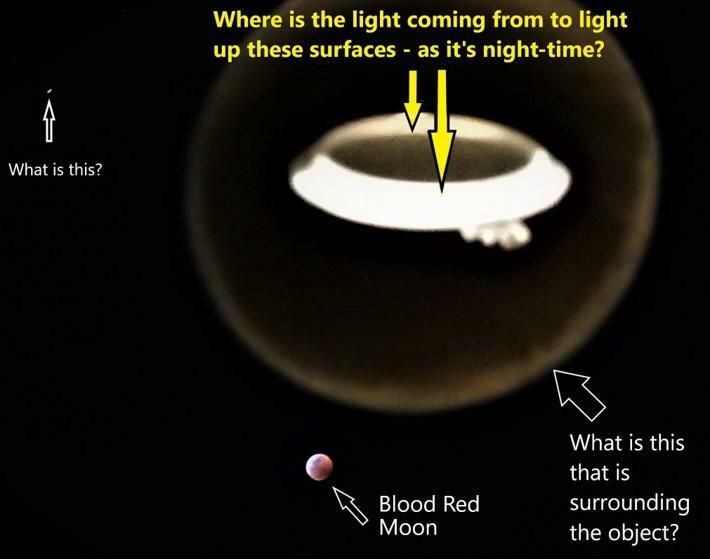 Witness Statement: In my picture of the blood moon before the eclipse started there is a glowing UFO under the moon. 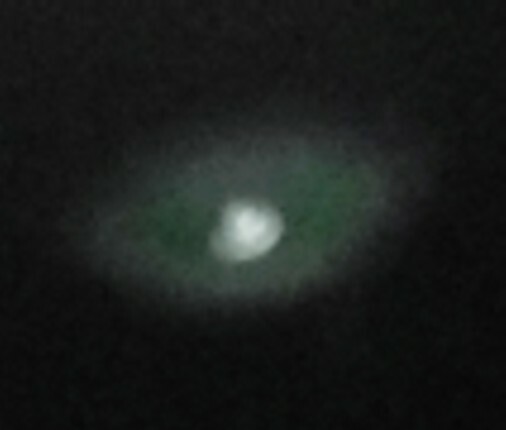 Seems to be a UFO-like object that is either blue or green in color and shaped like a UFO. Not sure how far away from the moon it was but it must have been something as it was gone about an hour later. End.